1. Combine all ingredients, except chicken, into the blender until pureed. And set aside. 2. Season with salt and pepper, and marinate whole chicken in 1 cup liquid puree. 3. Have ready heated oven and roast chicken until done. Remove chicken from roasting pan, add the remaining liquid curry puree. Simmer until thick to make the curry sauce. 4. 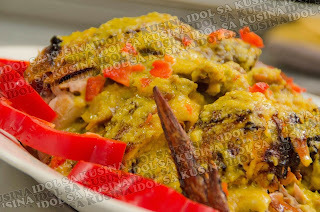 Cut lechon manok into portion size and pour the curry sauce on top. Serve with white rice.